"All Scripture is God-breathed and is useful for teaching, rebuking, correcting and training in righteousness" (2 Timothy 3:16). Christians believe the Scriptures are God-breathed and authoritative. By God-breathed we mean that the Holy Spirit communicated to the author precisely what God intended, and that the author, in his own words, accurately recorded what was communicated. Authority does not mean that everything contained in the Bible is true -- the narrative is completely accurate, but not necessarily every fact contained in the narrative is true. For example, in Genesis 3:4 Satan told Eve, "You will not surely die." Not only did Eve die spiritually as result of her transgression, but she also began to die physically. Authority does mean that everything God spoke, either directly or through a prophet, is true: "For prophecy never had its origin in the will of man, but men spoke from God as they were carried along by the Holy Spirit" (2 Peter 1:21). This is an aspect of Scripture that can be tested. The prophetic writings contained in the Old and New Testament are there because the authors have been tested and proven to be completely reliable. In ancient Israel a true prophet, one who spoke in the name of the Lord, had to be accurate 100% of the time. If found to be in error the prophet was labeled a false prophet, and was executed. Christians are sometimes accused by critics of using circular reasoning when they use Scripture to prove Scripture. After all, critics say, you can't quote the Bible to prove the Bible. That argument is flawed. The Bible is not a single book, but rather, it is a collection of 66 books penned by at least 35 different authors living on different continents and in different centuries. Each of the 66 books has been tested and shown to be a reliable witness of God's communication with man. The circular reasoning argument is not valid where the Bible is concerned. The reliability of the Bible as God's word can be affirmed by examining manuscript, archeological, prophetic, historical, and statistical evidences. It can be tested, and it passes the tests. All cults deny the authority of Scripture. All have additional writings that they consider to be on a par with, or superior to, the Bible. In reality, their extrabiblical "revelations" will not stand up to critical testing. Those cults that claim to accept the authority of Scripture accept it "only as long as it is interpreted correctly." In other words, they accept only their own cult's translation or interpretation of Scripture -- which they always twist or mistranslate in order to "confirm" the cults unscriptural teachings. 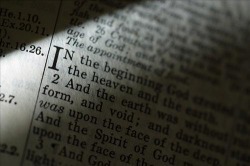 The authority of Scripture is an essential element of historic Christianity. It is not a doctrine that can be compromised.